There are a million ways to make money in the market, at the end of the day there is no right or wrong way. Today, Carl Ichan showed the world how he made over $2.1 billion dollars on a $321 million dollar investment. 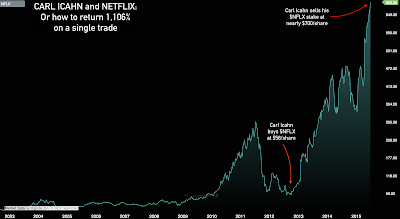 Carl bought $NFLX in late 2012 when the stock was in a downtrend, near its 52 week low, he sold it today as it traded at all time highs. Buying stocks near lows and in downtrends goes against what every trading book and trading guru advises you to do. Carl made over 1000% doing the exact opposite. 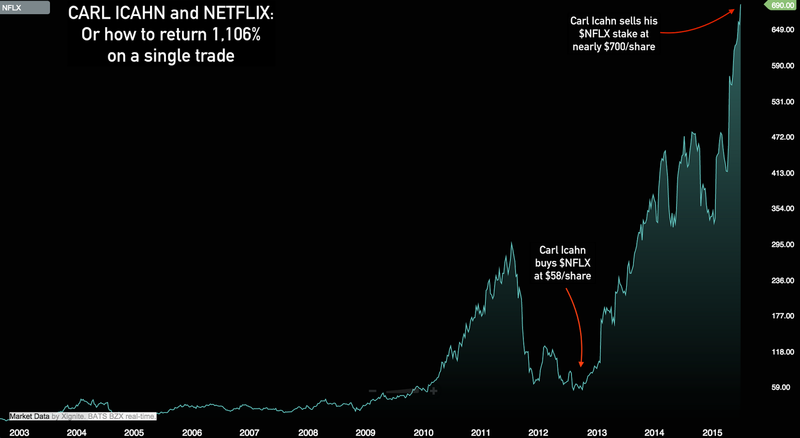 Next time you read or hear one of these preachers preaching to only buy near highs, not to look for stocks near lows, only losers average down losers, don’t sell a stock going up, etc….Tune them out and remember Uncle Carl and his $NFLX trade.